Jasmine El-Gamal returned to The Drive yesterday to explain her experience in the chaotic first days after President Trump’s order blocking entry by persons from seven predominantly Muslim countries. (The order was later blocked by the 9th Circuit Federal Court.) Here is her interview in which she describes the situation she found at Dulles Airport in Washington DC in those first chaotic days and gives her analysis of the real meaning of the executive order. For more from Jasmine El-Gamal, visit her Twitter page, https://twitter.com/jasmineelgamal. For more information about the Brent Scowcroft Center on International Security, visit its page at the Atlantic Council's website, http://www.atlanticcouncil.org/programs/brent-scowcroft-center. Joining us now is, well, she’s been with us before, Senior Fellow at the Brent Scowcroft Center for International Security, which focusses on issues related to radicalization and extremism, she has served four Secretaries of Defense, as an advisor on Iraq, Syria and Lebanon, in addition to having served as a translator in Iraq with the US military, way back in 2003. She’s back with us now, Jasmine El Gamal. Hi Jasmine, thanks for being with us. JEG: ...trying to figure out what to do with my life, and it was early 2003 and as you know we were preparing to go into Iraq and I got a letter in the mail one day asking if I spoke English, if I spoke Arabic and if I liked to travel. So you can imagine that I said yes to all of those things but I definitely did not anticipate ending up in Iraq at some point. Yeah, you were thinking the Bahamas or something! So I ended up there, and here I am! I grew up in Egypt and was born in New York. Wow, cool. All right. The situation over the weekend, beginning with Friday’s executive action there, what are your thoughts on all this? Well, let me just tell you a little bit about what the executive order said, Steve, and maybe you can ask me a little bit about it and see what part of it you want to explore in this conversation. The executive order that came out over the weekend basically, among other things, temporarily suspends all refugee admissions to the United States for 120 days, but suspends specifically Syrian refugees indefinitely. It also banned citizens from seven Muslim-dominated countries from travelling to the United States for the next 90 days. The seven countries are Iran, Iraq, Libya, Somalia, Sudan, Syria and Yemen. Initially, as the executive order went into effect, Green Card holders from those countries were also affected, even though you and I both know how long it takes to get a Green Card and what it means to have a Green Card and be a US Green Card holder. Didn’t they change that though? They adjusted? They have, they have. Initially, I was at Dulles Airport on Saturday. I went there to be sure that everyone was able to communicate. I went there in case anybody by some off chance needed an Arabic translator, and I could help out in any way. But when I got there, it really dawned on me, seeing the chaos unfold, was that no one really knew what was going on. A lot of people, most, all of the people, actually, being detained for hours because of this executive order, didn’t have access to lawyers or translators or anything like that. Eventually it was clarified by the Department of Homeland Security, that now Green Card holders would be allowed in, but they still need a waiver to do so. So, in theory, all the waiver requests have been approved, it still means that, even if you have a Green Card, and you’re from one of those seven countries, when you’re flying back to the US, you will be let in but you have to apply for a waiver first. And those waivers are accepted or denied on a case-by-case basis. We’ve been hearing all sorts of stories, including referring to what you just talked about, not being able to talk to lawyers or translators, which is really, to me, just spectacularly wrong. It was a pretty confusing scene at Dulles. I mean, I was watching the press secretary’s press conference today where he said that, you know, it’s been a smooth process and that things were unfolding really well. I have to tell you, Steve, that I was at the airport on Saturday and it was the first day of the executive order being put into effect. It was placed into effect basically as a lot of these people were in transit. And so when they boarded their flight from whatever country they were in, it wasn’t in effect. And by the time they landed in the US it was in effect. And it changed a lot of things for them but they didn’t really know how or why or what to do about it. There wasn’t a lot of advance notice and there certainly wasn’t a lot of advance coordination with other inter-agency actors. And so, it did cause quite a bit of confusion in the airport at the time. Even a lot of Republicans today and over the weekend were saying that this executive order was not properly vetted and it was all of a sudden he signs it and all this, you know what, hits the fan without thinking it through and without making it, you know, work, really. The administration says that it was vetted with the appropriate individuals but reports from several other sources tell us that it actually wasn’t vetted as extensively as it probably should have been. For example, with the Department of Homeland Security and the Department of Defense and other departments, that could have offered some sort of insight into the legality and application of the executive order. A lot of people are saying that this is going to make us more unsafe because it’s, you know, ISIS is using it as a recruiting tool, that, “...this proves that we are at war with the US” and yada-yada. And by the way, I think “yada-yada” was in that executive order. ...and we all want America to be more propserous. Now the question is, is this executive order and the way in which it was drafted and released does not make us safer. You brought up a couple of ways in which it actually might cause more problems than it solves. One of those ways is, yes, in fact, a lot of the countries on the executive order, they are seven countries in all, have suffered from incidents of terrorism in the past. However, if you look at the number of attacks in the United States over the last couple of years, and the people who perpetrated those attacks, they all had ties to countries that are not on that executive order. Exactly. Including 9-11, which most of them were from Saudi Arabia. Exactly. So 9-11 was linked to Saudi Arabia, mostly. San Bernardino more recently was linked to Pakistan. And so, why aren’t those countries on the list? Now, I’m not making the argument for adding more countries to the list, I’m saying, why does this list look the way it does? Is it really about making our country safer and does it actually make our country safer? So that’s the first point. The second point is something that you mentioned, which is, you know, orgaizations like ISIS and other extremist organizations have thrived on creating this clash of civilizations and us-against-them dynamic, that forces people to choose between one of the two sides, even though it’s a completely false choice. So if you’re a Muslim living in a western country, all of a sudden you think you have to choose between being Muslim and being American, or being Muslim and being French. When in reality, I can tell you that that is certainly not the case. And so what this executive order could do potentially and be interpreted as is actually making people go through the same decision-making process, which is to say, OK, apparently I’m not being allowed into the country because I’m Muslim, so does that mean I’m Muslim or does that mean I’m Iranian or does that mean am I Muslim first or am I American first? Am I a Muslim first? So it casues the same dynamic, the same culture of “us versus them” that ISIS and other extremist organizations are trying to provoke. And I think that’s very destructive that I think that’s a false choice. The final thing that I’ll say about that and whether or not it makes us safer is actually, right here at home, in terms of the American people themselves, I think that less resilient societies, societies that are more divided, have a harder time sticking together in times of crisis, which makes them more succeptible to trauma, and to extremism and to attacks both from the outside and the inside. And so by making Americans fear one another, and by telling Americans that a certain religion, i.e. certain Americans who adhere to a certain religion, are potentially more dangerous than other Americans, what are you actually doing to us as Americans, as a society? Even Christian leaders in America have, for the most part, the majority has spoken out against this, which is fascinating to me. But Rudy Giuliani basically said on TV yesterday that Trump came to him and basically asked, how can I make a Muslim ban legal? And so they went with these seven nations and they talked about the terrorists in those nations and not Muslims. Right. I read those remarks and the thing is, as it currently stands, you can’t really call it a Muslim ban, right, because if you were banning Muslims, you would be banning over one billion Muslims that are in the world. It is not a Muslim ban, as it currently stands. I do agree that it is not a Muslim ban and I think that trying to call it a Muslim ban is more couter-productive than it is helpful. However, it is a ban that affects a disproportionate number of Muslims, that affects only Muslims, when you think about it, because there is a clause in the executive order that says that religious minorities from certain countries will have priority when it comes to asking for entry into the United States, because of religious persecution, which basically is translated as, OK, if you’re from one of those seven countries, and you’re not Muslim, you’ll be prioritized. So you can see why people think it’s a Muslim ban, and why they’re saying it’s a Muslim ban. Effectively the Trump administration can say that this is not a Muslim ban because we’re not banning all Muslims from all countries. But what we have to ask as concerned citizens and as concerned policy makers, is, “Is this ban effective?” What is it actually doing to achieve your stated goal? And if your stated goal is to make America safer, well here are all these ways in which this executive order is actually not making us safer. Can we talk about that? Wow. Well, OK. I have a feeling, and I hope, that you and I will be talking a lot more this year. 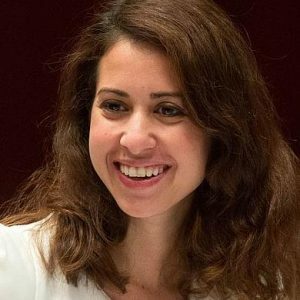 Jasmine Al Gamal, a senior fellow at the Brent Scowcroft Center on International Security, focussing on issues related to radicalization and extremism. She served four Secretaries of Defense as an advisor on Iraq, Syria and Lebanon, and she served at the very beginning of the War in Iraq as a translator with the US military. Thank you so much for taking the time, let’s talk again. Thank you so much, I’d love that. Thank you.